When you use Speedify, all of your network traffic flows through one of our Speed Servers. To software and web sites that attempt to track your location (geolocation) via IP address, you will appear to be wherever our Speed Server is located. 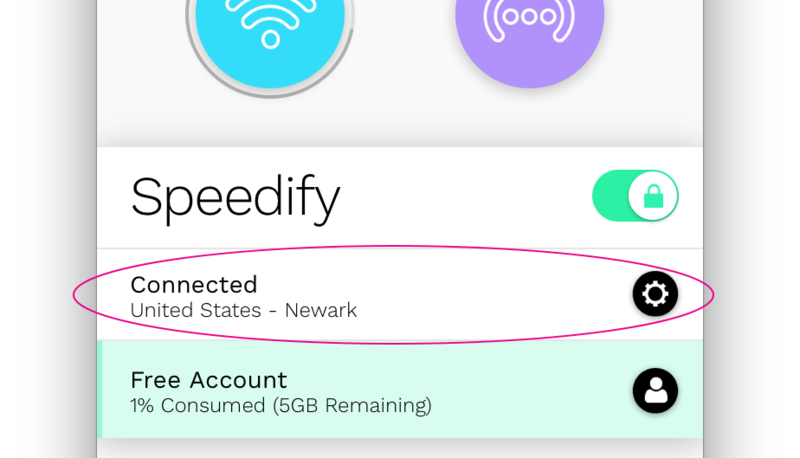 By default, Speedify picks the closest Speed Server to give you the internet connection with the lowest possible latency. You can tell Speedify how to pick which Speed Server to connect to by clicking on the Connection Status area in the center of the Dashboard or on the gear icon. This will pull up the Servers screen, which defaults to Fastest Server. To change your sever, click the more... under "Choose Country" to see the full list of supported countries. Some countries may show you individual cities. If so, you can either pick the country (which always gets you to the fastest available server in that country) or you can pick a specific city under the country. In general, you'll want to just pick the country and let Speedify make the best choice in that country for you. However, Speedify also allows users to select a specific server within a city. After finding your desired city, click the arrow to the right to expand the list of available servers. After you've made your selection, click the X in the top right to close the Servers screen. Note that if you wish to use Bittorrent, you must select "Torrent Friendly Server" which will connect you to a server in Amsterdam.